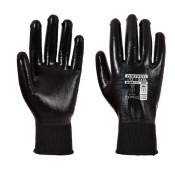 Constructed with a comfortable and breathable liner, the lightweight Portwest 3/4 PU Dipped Handling Black Gloves A122BK use a 3/4 dipped PU coating to provide extensive protection to the hand. 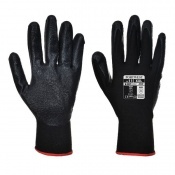 This gives the gloves the maximum level four abrasion resistance, while their flexibility makes them perfect for general handling applications. The Portwest 3/4 Dipped Handling Gloves have been designed for comfort, with a highly breathable and soft inner pylon liner. 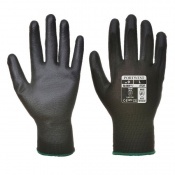 The polyurethane dipping provides excellent comfort and grip, making these gloves ideal for extended use during general handling applications. 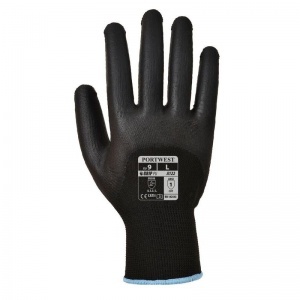 The Portwest Gloves A122BK are available in four sizes that should be suitable for most users. To find your perfect pair, please measure the circumference and length of your palm and match the results to the table below.